Welcome to Found Off The Street, our look at cars found on the cape that rust liked so much it decided to summer there; Cape Cod, MA. Today we have a Mercedes Unimog 406. Although the car spotting on the Cape that rust remembered has been rather slim recently, this awesome Unimog is a great way to break our interesting vehicle drought. Spotted in an industrial area of the cape rust remembered, this Unimog was nearly ready to hit the road. When we returned a few days later to have a second look this unique Unimog had already moved on. Unimogs were first created in the wake of World War 2 as agricultural implements with Power Take Offs and they quickly became famous for their off road capability. Although not initially a Daimler Benz design, they took over production in 1951 and still produce a version of the Unimog currently. The name is an acronym formed from the German phrase "UNIversal-MOtor-Gerät" (Gerät roughly translates to machine). The model seen here is a 406 which was first introduced in 1963. We've seen a Found Off The Street Unimog before, but it was a long wheelbase earlier model that didn't look too far removed from its military roots. This short wheelbase 406 looks like a bizarre vehicle from another planet when it is parked next to just about anything else. From the custom racks to the massive tires, it's clear this Unimog has been redone with off road fun in mind. 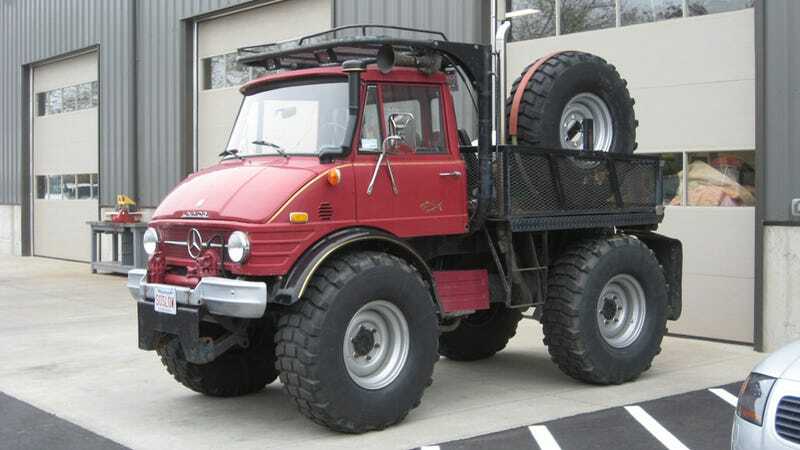 This Unimog is powered by a four cylinder diesel engine which produces 65 horsepower. One look at the massive tires being propelled by this relatively small amount of horsepower and you can quickly understand the owner's choice in vanity license plate (SOSLOW). Unimogs were never meant to go fast though, and what this vehicle lacks in top end speed it more than makes up for with its low end power and off road ability. When I first came across this 406, I managed to contain my excitement from finding such a cool Unimog long enough to take the pictures seen here. I planned to make my return a few days later to get pictures of this cool rig and inquire further about the truck. When I came back a few days later, the shop was still closed and the Unimog was nowhere to be found. Although I consider myself fairly perceptive when it comes to car spotting on the cape that rust remembered, I've yet to spot this awesome vehicle again. Hopefully the truck was relocated because someone is now out cruising the beach and enjoying this cool old rig. I sincerely hope one of these sunny days I'll see the Unimog rumbling down the streets of the cape rust remembered, looking as awesome as it is out of place.